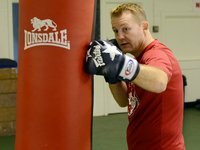 The boxing stance is a really important part of boxing. 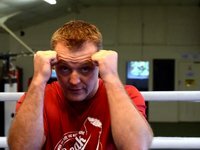 It is your foundation or base if you like, from where you will be throwing all your punches and defending from incoming punches. 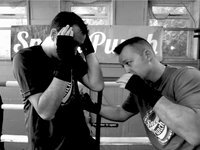 If the base is strong you will be able to punch harder and take pShow More unches better. 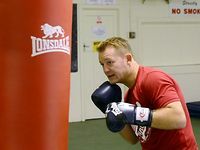 There are 2 main types of stance, and they are dependant generally on whether you are right handed or left handed - The right hander will normally use an orthodox stance, this means having the right hand and foot at the back of the stance and the left handed person will normally use the opposite, the southpaw stance which will have the left hand and foot at the back. 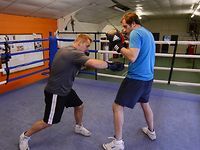 This is all due to power, in boxing the stronger hand is kept at the back and used as a power shot pushing up from the floor, twisting your hips and powering the back hand forward. 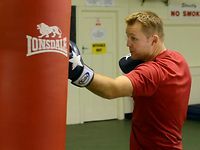 Ultimately I don't believe there is an absolute perfect way to stand in the boxing stance, I think due to the different make up of peoples physical attributes all I can do as a trainer is get the student to feel as comfortable as possible in their particular stance. 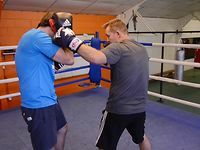 The football kick (as shown in the video) is a great way to do this as it doesn't stick to any hard and fast rules - be able to kick a football, stand shoulder or a little over shoulder width apart and keep to 50/50 body weight ratio (so you can come forward or retreat quickly) bend the legs slightly and you are done. 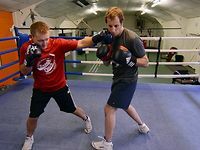 Many great boxers have not conformed to a certain style of stance and here are some to name but a few.